China Manned Space AgencyAn illustration of China’s first space station, Tiangong-1, orbiting Earth. The Chinese space station Tiangong-1 came crashing back into Earth’s atmosphere at approximately 8:16 p.m. ET over the South Pacific. Tiangong-1, which translates to Heavenly Palace in English, was China’s first station launched into space. 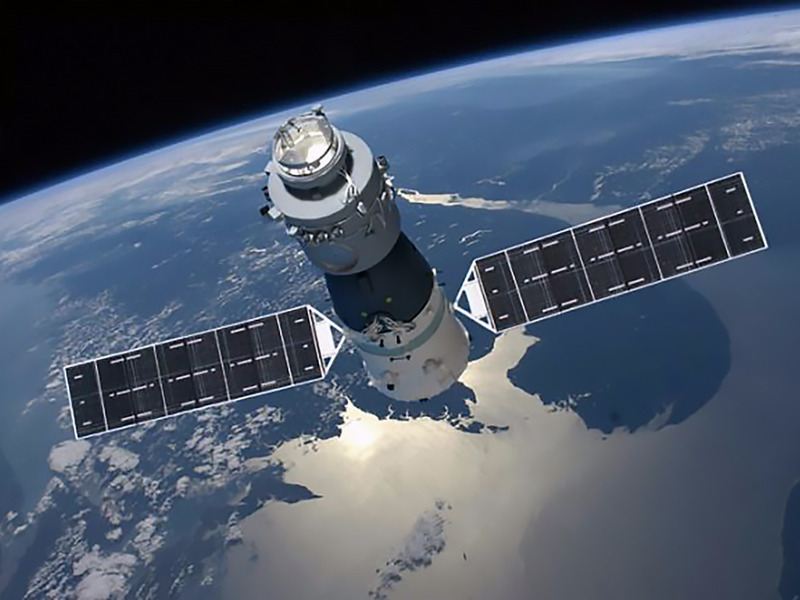 Tiangong-1 was used to practice docking maneuvers and was visited by two crews of Chinese astronauts. China lost control of the station in March 2016 and launched the Tiangong-2 space station into orbit later that year. The first space station China launched into orbit is no more. The space station Tiangong-1, which translates to Heavenly Palace in English, came crashing back into Earth’s atmosphere at approximately 8:16 p.m ET over the South Pacific, according to numerous sources, including the Joint Force Space Component Command, a statement from China reported by AFP, and The Aerospace Corporation. Reports indicated that the space station burned up in the atmosphere over the Pacific Ocean northwest of Tahiti, not far from the “spacecraft graveyard” where space agencies often try to land debris from spacecraft. Debris is most likely scattered over a long stretch of ocean in that region. Tiangong-1’s end was anticipated for years. The station was launched at the end of September 2011 and was visited twice by crews of Chinese astronauts, known as taikonauts, in 2012 and 2013. But China lost contact with Tiangong-1 in March 2016. The space station’s orbit has been slowly decaying since then. By May of last year, Tiangong-1 was coasting about 218 miles above Earth, dropping by about 525 feet a day. It was then just a countdown to figure out when and where it would break up in Earth’s atmosphere. 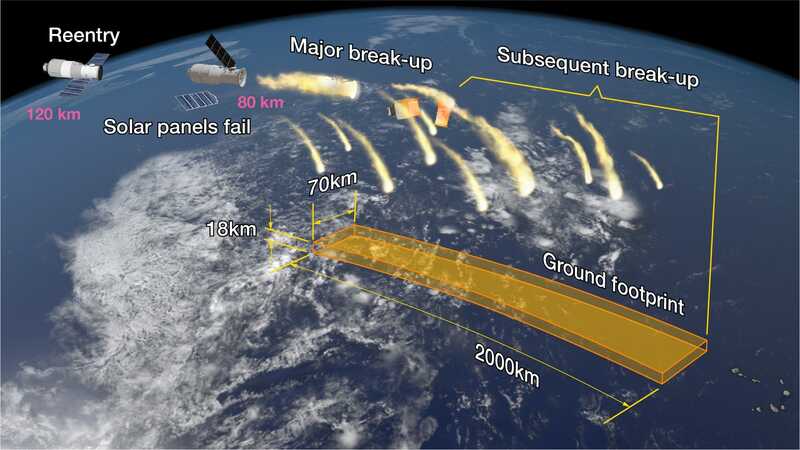 Aerospace CorporationAn illustration showing how China’s Tiangong-1 space station was expected to break up and scatter debris. Tiangong-1 was a school-bus-size 9.4-ton spacecraft – about 34 feet long with a volume of 15 cubic meters, or about one-sixtieth the volume of the International Space Station, which is the length of a football field. When space stations come down, “a funny thing” happens that helps doom the spacecraft, Jesse Gossner, an orbital-mechanics engineer who teaches at the US Air Force’s Advanced Space Operations School, previously told Business Insider. That’s because the spacecraft is losing its forward speed, allowing gravity to accelerate the space station toward Earth. The air is still too thin to slow it down much, so it plummets faster and faster. As the spacecraft falls into thicker air, the drag slows it down and begins to rip off solar panels, antennas, and other loosely attached pieces. Superheated plasma heats the vessel to thousands of degrees, melting and disintegrating it. Only a few types of materials, like titanium, can withstand such punishment. 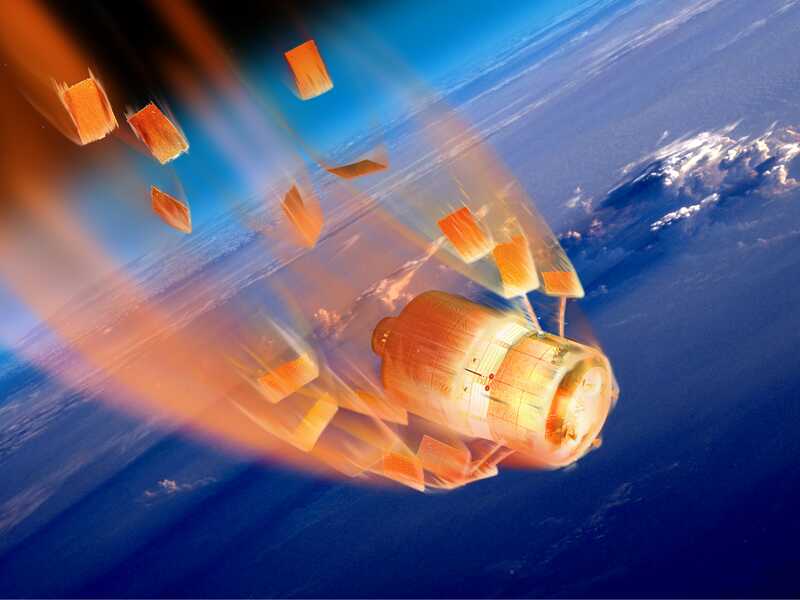 There is a chance that some gear and hardware left aboard could survive intact all the way to the ground, according to Bill Ailor, an aerospace engineer who specialises in atmospheric reentry. That durability is thanks to Tiangong-1’s onion-like layers of protective material. “The thing about a space station is that it’s typically got things on the inside,” Ailor, who works for The Aerospace Corporation, previously told Business Insider. “So basically, the heating will just strip these various layers off. According to the statement from China quoted by AFP, the station was “mostly destroyed” upon reentry. The chances that debris from the station would hit a person or even end up on land were infinitesimal from the start. But if a hunk of titanium, a computer, or another piece smashed through a roof or windshield, international space law would cover compensation for victims. “It’s China’s responsibility if someone gets hurt or property gets damaged by this,” a NASA representative previously told Business Insider. If intact material from the station is recovered, it’s still Chinese property. Any debris that made it to Earth would be all that remained of the station China first launched as a step toward creating a permanent presence in space. In 2016, Tiangong-1 was superseded by Tiangong-2. And China is now considering plans to build a much larger space station in 2023. The station’s fiery demise, however, illustrates a larger space-junk problem. Tiangong-1 was just one of 14,000 uncontrolled objects larger than a softball in orbit around the Earth – something experts say could have scary consequences. Now there’s one fewer object to worry about.